Usually parents in the midst of potty training their toddler are the ones asking this question: how long should potty training take? And, usually these parents are asking it because they feel like it might be taking them a bit too long (um, like, having been at it for over 6 months now). Today I will demystify the timeframes involved with toilet training your youngster and reaching complete independence (two very different phases of the whole process). the hardest part about potty training (you’d be surprised). If you’re contemplating potty training, in the middle of it, or wrapping up EC with PT, this video is definitely for you. 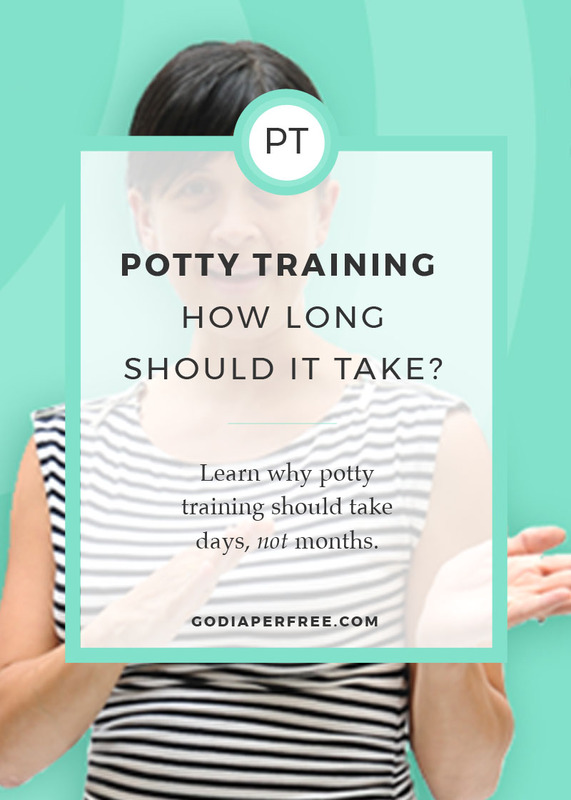 please share with us in the comments below how long you’ve been at potty training, and how much longer (after watching this video) you plan on taking to wrap it up. I look forward to seeing where everyone’s at. And remember...this is a judgment-free zone! Feel free to be completely honest! Ive been using the ec method with my second child on and off since birth. He is 15 mo old. With our 3rd child on the way i would love to have our son signaling and going to the potty in 5 months or less. I am catching certain pees, have struggled with poops, he wants to stand up and gets very distracted when i sit him on the potty to poop. Question: on the video today you mention potty training should take around 7 daysvto get the concept. During these 7 days diapers should be ditched as much as possible? I know u always recommend using diapers as bavk ups not to rely on. During these u days should i just put some pants on him and work with him as much as i can at home? Andrea. Am from India. My daughter has just turned 1. And I have learnt about EC about a month ago.. finished reading your book. tried a week ago. Quit after 4or 5 days as I caught a flu and couldn’t manage. I’ve learnt a couple of things in those 5 days.. about cues timings of my daughter. Here’s my question..
Hi Andrea, Thanks for your response. I should have added that I did also buy your book! It is very useful but we are still struggling with what appears to be behaviors but not really sure. Would love to use the private support group resource- is that the Facebook page? If so, I’ll take the conversation over there. This was interesting! I just potty trained my son (using the Oh crap potty training method). He was 22.5 months when we started. After the first week he was still a bit clueless and we couldn’t stay in any longer so we hand a few outings where he wore nappies (only a handful over the next 2 weeks). I’m sure it did slow him down a bit. We stopped using any nappies at all after week 3 and he stopped having accidents a few days later. Now it’s abouy week 7, he’s fully self initiating, dry after every nap (so we stopped using a nappy then) and wakes up dry around 50-60% of mornings (we haven’t tackled night time specifically yet but he seems to be working on it himself!). I’m amazed by the progress in the last month. I’m happy enough he’s just turned two this week and is out of nappies and it only took about 4-5 weeks to reach full independence, but I do agree it might have been a little faster if I’d made some tweaks. But – not even one of my friends is potty training yet so I just feel so glad we did it at all! Also I would 100% start earlier next time! I was about to become a SAHM though, so I just waited til I was done with work and home full time. We wrapped up EC using the OCPT method at 15 months (during my summer break from school so I was home with him). We still use diapers for nights, naps, and long car rides. Within a week or two, it brought us from hardly any poop catches and about 50% success with pees to hardly any poop misses and just a few pee misses. So amazing! We were at about 1 miss a day for a few months there, usually pee misses, but he went back to daycare and our provider requires that he still wears his diapers because she only potties the kids based on timing rather than signals and he has occasional misses there. We also did a ton of long trips during this whole period, which made it difficult to catch everything due to car seats and such. But, it’s been really awesome to see that by 18-19 months he was almost never having any misses (except at daycare occasionally), and usually when he did, there was something going on with his digestion. Now at 21 months he is fully independent, including manipulating his own clothing, and it feels amazing! :D Thank you Andrea for making it possible for us to be out of diapers so much earlier than other parents we meet! Hi Andrea! I am potty training my 22 month old using your book. Although I have followed your book (and you have such good, clear instructions in it) I still feel like I’m not totally sure how we’re doing. We started this last Monday. I had thought I would move on to step 2 after one day (as I have done part time ec with her for about a year now) but I wasn’t sure she was catching on to ‘pee goes in the potty’. But Wednesday I moved on to small clothed outings and today we went grocery shopping (a one hour outing). But I’m still not sure that the part of all pee goes in the potty has clicked with her. If I initiate (natural timing, transition times, some signals) then we can get almost all pees in the potty but it doesn’t seem like she is initiating herself yet. Is this ok for potty training? I feel like probably after a while maybe she will start to initiate but is that called dragging out potty training?? I’d be glad for any help! We started with EC, mostly part-time/trying full-time, with our little man from 6months til we started potty-training with your book/method at 19months (probably would have done it earlier in hindsight, like 12 months). Potty-training (started Nov 1st) took 4-5days, 2 naked and 2-3 clothing full-time with excursions; we have had a couple misses (like 0-2 a week) mostly start to pee (I think mostly me missing the cues/son resisting but not wanting to be left alone to potty yet). We did both day-time and night-time together (he will wake up and go once during the night so he stays dry upon waking/nursing in AM). Overall, he is doing well – we are just working on getting better at clothing management and him being more independent with the whole process. He even did well with a babysitter one night! 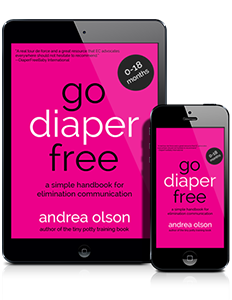 I am very thankful for the EC and your potty-training method, Andrea, as I feel it has been the best fit for our family and the rest of our relatives/friends are shocked (but think it is pretty cool!). It really just all makes sense and I appreciate all the history/background info. I recommend you to our friends/family with little ones and potty-training. Our girl is 14 months old, and we’ve been doing EC light with her from the beginning. She has never given a clear sign for pee as I’ve been able to see, not physically or sound (I’ve made the “tss” sound for her ever since birth), so it’s been more a timing, intuition or by chance thing, and still is. Poop was different, as she normally farted beforehand and it usually was happening right after feeding so she was in my arms and I could also feel it on her body – or she would poop in the morning. So from say 3 to 12 months we had hardly any poop diapers. Great! But for the last two-ish months something has changed, and we’re now having several poop diapers a day :-O She has not been a complainer about dirty diapers either. Surprisingly, as she hasn’t really been used to having them.. I struggle to see her poop cues, and when I do see them, she gets furious if I try to take her to the potty. If I ask her, she will not come. She also often hides, like under the table, or go into another room than me, when she has to poop.. I have been using sign for poop for quite a few months now, but she’s not using it herself as of yet. She’s a very independent and aware little girl who loves to try and to (impossible) things on her own, and it’s super frustrating to have ended up here, after having been so successful with EC light beforehand.. Thanks for sharing your knowledge with the world!! I started potty training my 5 month old a week ago. I’m doing part-time and I take her a few minutes after she finishes her bottle. This way I am catching most of her pee time. Sometimes she pees during a feeding. She follows my signal “Let’s go peepee” and “psss” then she starts. For her poo, I put her dirty diaper in the toilet to catch the poo so I don’t have to scrape it out. Any suggestions for that? Also I’m afraid to stop using diapers completely since she’s not using the toilet 100% of the time, pees a ton at night, and I don’t want to deal with accidents around the house or when out. I had heard about EC previously (and experiemented with it a bit), and it recently came back on my radar somehow, in the form of your site. My 8th baby is now 18 months old and I’ve been inspired to help her to diaper-freedom ASAP. I’ve been giving her potty-tunities at virtually every diaper change and some other times, for maybe a week. We have had NO hits and I’m starting to get a little disappointed. The potty-training method I have previously used is intensive (originally designed for mentally handicapped people, heavy on the rewards) and I don’t know if I can pull it off with 7 other kids in the house, including a very inquisitive and energetic 3 year old boy!